It seems like I have been occupied taking lots of small steps with large projects recently and have neglected to take photographs and write posts about them. This is one of those jobs that have been on the go for a while. 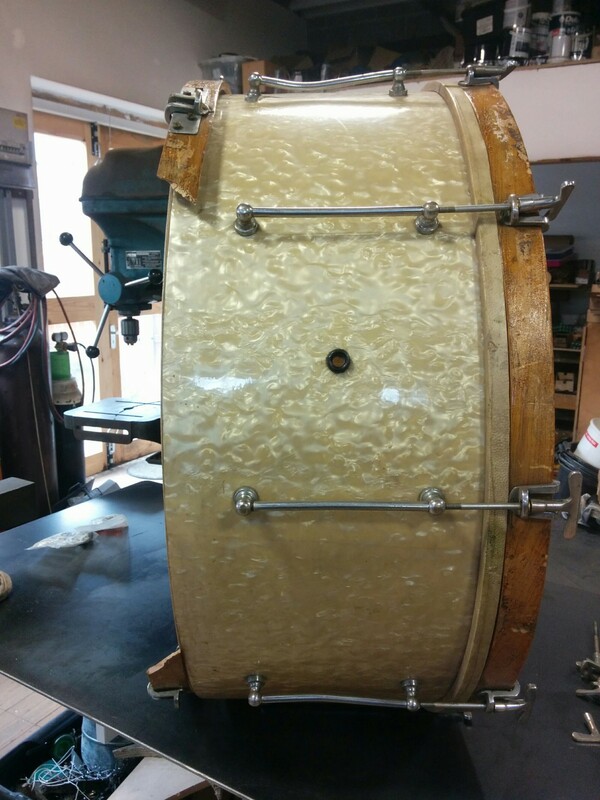 As can be seen this vintage bass drum has seen better days. There are several aspects that need to be repaired. First on the list to make a new counter hoop to replace the original which is in several pieces and cannot be practicably repaired. 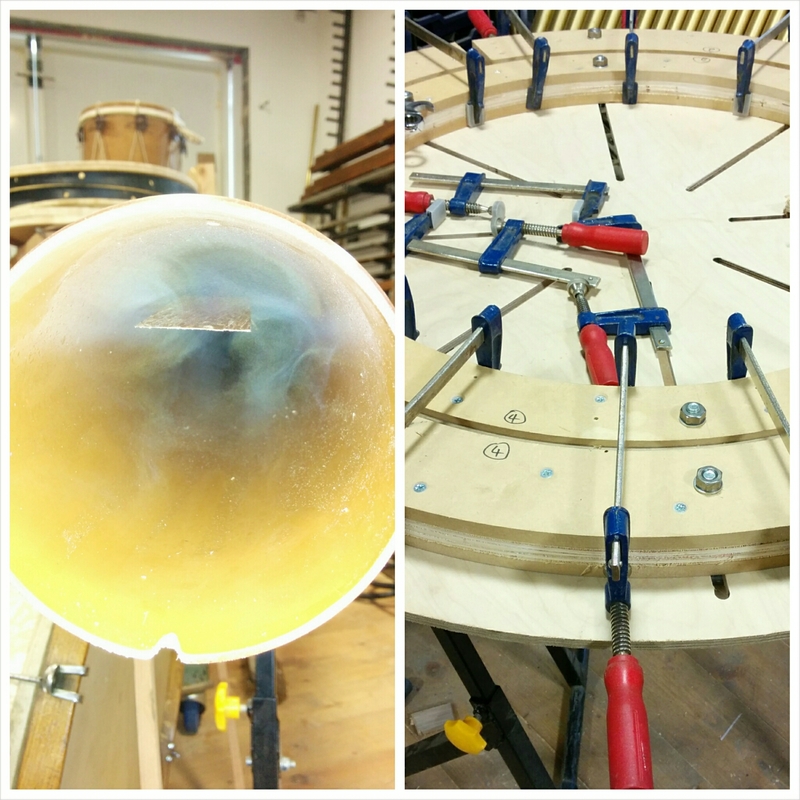 I have never needed to make a counter hoop in wood before, the hoops I make are normally polished stainless steel. This lack of prior experience is never a problem, the reality is that I spend most of my working life going into the unknown, which is how I develop new methods and techniques to constantly improve quality. What I therefore do have is a lot of know how. So I started by planing a long board of oak to the depth of the hoop and cutting off a thin strip, in the above picture I am using the thicknessing sander I built to clean up the sides of saw marks and make the width uniform. 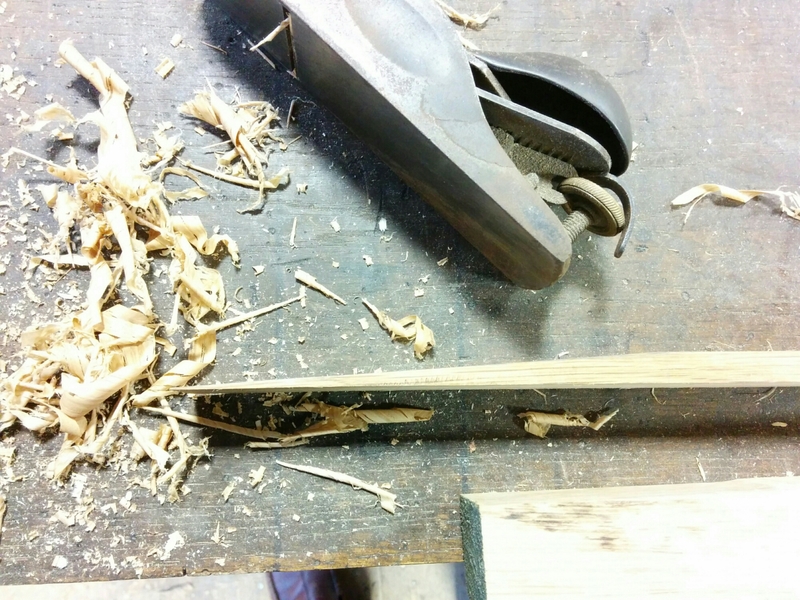 There are two types of jigs or pattern used to make things; internal or external. A pie dish is an external mould. I made an internal mould to prevent the hoop forming below the correct diameter. Then I calculated the circumference which gives me the length of the strip of wood so that I could angle the ends to create a scarf joint. 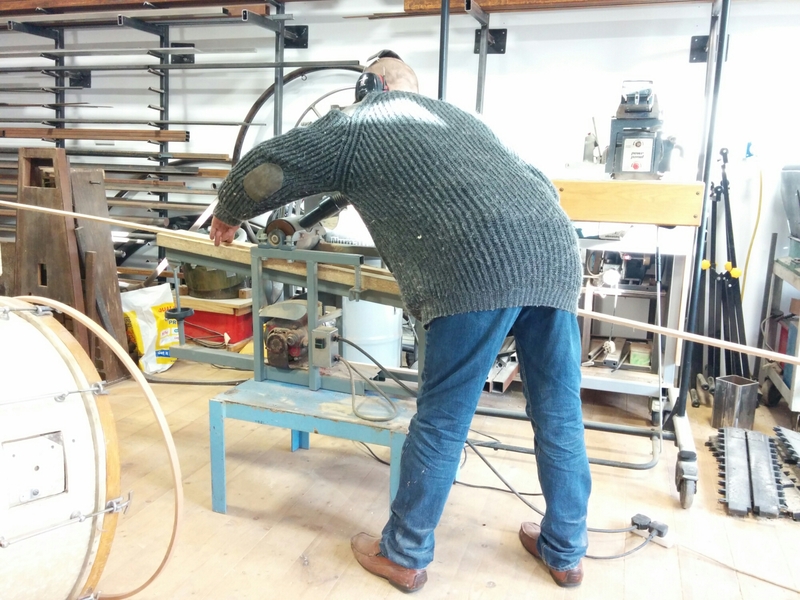 The long strip is then steamed (inside a long tube) until it goes floppy, then bent around the mould and clamped in place until the wood has cooled and set. The next day the hoop came out of the mould so that it could dry off for a while. When oak gets wet, the tannins are pulled out and the surface of the wood (and my hands) get stained black. The moisture will also lift surface fibres. Both issues are resolved by sanding until that surface layer is removed. The final step before varnishing is to create the radiuses on the external edge. The next job is to make replacement barrels for the tuning lugs. These are solid with the thread cut into them, so to replicate them it is lathe work: drilling a small pilot hole a long way into a thin rod. This is a heart in the mouth process, if that drill bit snaps inside the rod, then it goes in the scrap bin; obviously there is a hole at either end. Patience, care and feel gets there in the end. 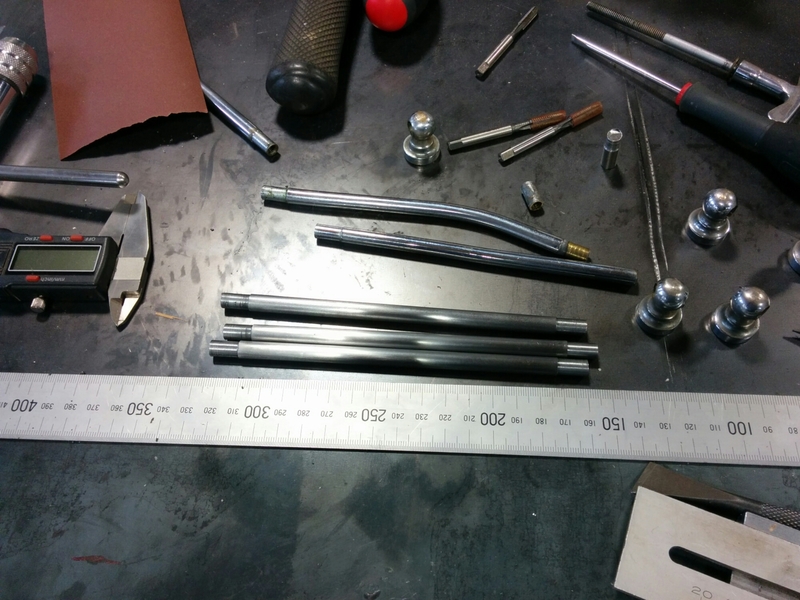 With the barrels made, they can be sent to be chrome plated. 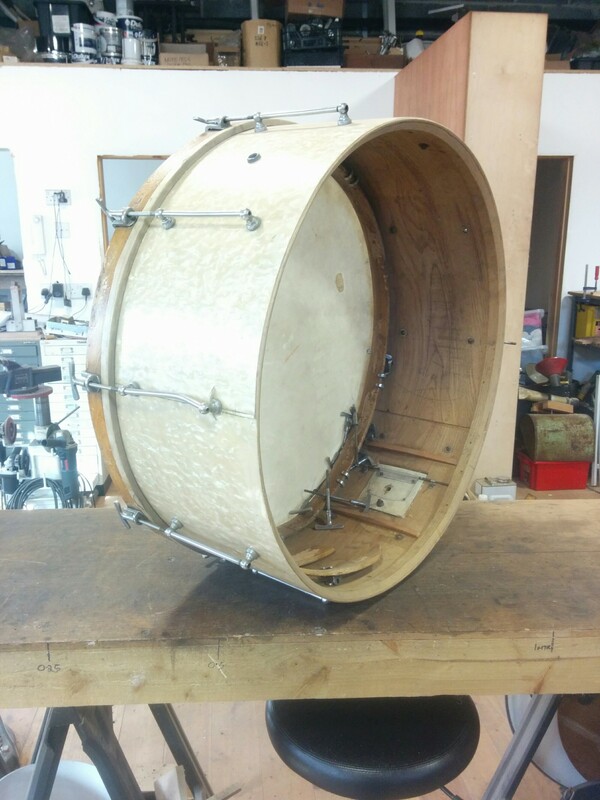 In 1233: (part 2) I will assemble and finish the drum.